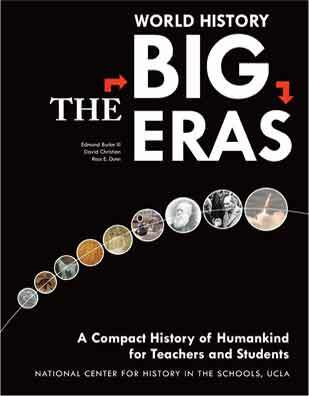 The National Center for History in the Schools (NCHS), UCLA is pleased to announce publication of a new edition of World History for Us All: The Big Eras: A Compact History of Humankind for Teachers and Students. In 163 pages, this book tracks a new extension of the human adventure from the time of our earliest bipedal ancestors to today. This innovative contribution to the study of world history on a very large scale was authored by Edmund Burke III, Prof. of History at UC Santa Cruz; David Christian, Prof. of History at Macquarie University, Sydney, Australia; and Ross E. Dunn, Professor Emeritus of History at San Diego State University. In a seamless world-scale narrative, World History: The Big Eras brings together nine essays that appear in World History for Us All. Published in workbook format, this volume will be a valuable companion to all educators who use the electronic resources of World History for Us All. It also stands alone as a brief history of humankind, inviting teachers, students, and all global educators to explore the past on large scales. The book starts with the premise that study of the past on the global scale reveals patterns and raises questions that may be invisible at the lower scales of civilization, nation-state, and ethnic region. Middle and high school teachers wrestling with state content standards will find this concise narrative invaluable in developing coherent curriculum and for helping students connect specific topics to wider landscapes of historical meaning. The book's panoramic approach is also highly compatible with the Advanced Placement World History course. Order your copies of World History: The Big Eras from the National Center for History in the Schools, University of California, Los Angeles. "Students need to acquire a usable framework of the past, a big picture organized by substantive concepts they increasingly understand and can reflect upon."